After three spinal surgeries to correct scoliosis and degenerative disc disease, I developed an itch like most do, just under the skin of my back. Well it has been over one year and I sleep next to my back scratcher! I know (after working with an orthopedic surgeon) all the evils of scratching those itches. But I cannot help it. first I rub, then I scratch gently and then harder, then out comes the back scratcher or anything that will work! It's my entire back and part of my buttocks and even though the skin in these places is numb and feels thick, it still itches underneath. I am 63 years old and have been teaching kids not to scratch for a long time. One surgeon told me it was nerves regenerating. Another surgeon involved gave me a prescription of Atarax that did nothing and said it should be gone soon. That was about nine months ago. I recently had a third neck fusion. The rash started on my left ankle area after five days and then spread all over my body. I was told it was a blood infection. I am now on steroid medications for three days and will complete the medication regimen of one week. I find myself unable to stay awake and I am very weak. On June 1, 2017 I had a double cervical fusion in my neck c3,4,5,and 6 and ever since I have had the hives and big welts all over my body and a small red rash. Doctors are now wondering if I am having a reaction to the metal they used in my neck. Has this happened to anyone else? I recently had neck surgery 11-30-10 and everything went well. Seven hours is how long my surgery took. I stayed 2 days in ICU and 2 days on the surgery recovery floor. I was released and went home to heal. Two weeks later I started itching severely and a red whelped rash appears and my skin turns very hot in that area. My itching was so severe my husband called the ambulance and they admitted me to the hospital. The doctor and every nurse I saw had no idea what this was. They are treating the itching by Vistaril shots but it is still happening and on my face I have swelling but on the right side of my face only. Please anyone that can help me I would greatly appreciate it. Thanking you in advance for ANY help! I am about 3 1/2-4 weeks post operation from having back surgery in which my doctor placed steel plates and screws at my L3 and L4 levels. The surgery went well. I was in the hospital about five days. When I came home, I was fine. The weekend after Thanksgiving, I started having stroke like symptoms which turned out to be a severe UTI, and another three or four days in our local hospital this time. I was on an antibiotic drip for the entire time I was there. The whole time, during both hospital stays, I never itched. When I got home after about two or so days, I started itching. This itch is about to cause me to lose my mind. I've tried cortisone creams, a CVS lotion that their pharmacist recommended and of course, Benadryl. Nothing is working. Do any of you folks have any answers? This is unreal! I had a similar rash on the right side of my face only, that came up after entering the hospital and before my operation. As I'm very sensitive, I thought it may have been a reaction to the chemicals or detergent in the sheets as I woke up with it the first morning in hospital and it had to be treated with a special creams before they could take me to theatre. Over the years I have had several surgeries on my spine and shoulders. Each time, no matter what hospital I underwent the surgeries at, I always ended up with a severe rash (wherever the tape was) that opens and weeps causing severe discomfort. It takes a long time to heal and leaves the affected skin feeling like parchment. I have been told by two or three of my surgeons that there is some ingredient in the surgical tape that causes this reaction. They thought it might be latex but it wasn't. Could someone please tell me if they've found an answer as to what this ingredient could be? I am due for more surgery on the 24th of September, 2014 and I've tried to research the problem but there doesn't seem to be any definitive answer so far. I had surgery on my upper and lower eyelids two weeks ago. Now I have itching in and around my eyes that is so bad. The redness that is also present looks like I have a burn on my skin. I have received no help from the plastic surgeon for this skin problem. Does anyone have any ideas for treatment? I think you should get checked if the itchy skin rash does not go away. There is also a possibility that you can be infected. Doctors do not want to metion that there is a high risk of infection due to improper sterilization of the equipment used in hospitals. I had a surgery about 12 days ago - broken finger where they inserted a screw. In the first eight days everything was fine, then I wake up with a terrible itchy feeling and by the night my body was covered with random itchy bumpy red spots which were very severe and I was unable to sleep. I saw a dermatologist the next day who gave me some antihistamines and something to reduce itchiness and be able to sleep. I stopped taking Oxycodone plus Tylenol which was prescribed as a painkiller. I hope that was the reason I developed the rash. I read about people with dermographism who developed this condition and it has stayed with them. I hope it will pass soon and I am so glad your situation was resolved well! Strangely, I had a similar rash on the right side of my face only, that came up after entering the hospital and before my operation. As I'm very sensitive, I thought it may have been a reaction to the chemicals or detergent in the sheets as I woke up with it the first morning in hospital and it had to be treated with a special creams before they could take me to theatre. I hope yours is that simple. I am home now after 5 days in the hospital. No one in the entire hospital could determine why I had this itching rash that whelped when I scratched it. But they gave me Vistaril shots in the hospital and sent me home with Vistaril pills. I needed them only two days of being home and thank God literally I have not needed it since. I am not having the severe itching anymore and it appears to be gone. It's the strangest thing I've ever expierenced! I truly think it was my body's reaction to the metals placed in my neck, I had my C2-C7 rebuilt, I was told it's a titanium metal. I'm truly glad it's gone and I pray it never returns! I have been getting what appears to be dermatographism since March 2016. It started as an itching between my fingers exactly one week after having a lumpectomy. I've been taking 5-6 doses of different antihistimines every single day since. I still break out mostly on my arms and then it moves to my lower back, calves and ankles but can be on my thighs as well. I'm going to see a dermatologist at my cancer center next week. The only thing that totally stopped this was the five days following chemotherapy but back it came as chemo drugs left my body. The itching is awful and I'm miserable. It can't be good for me at my age to be taking so many antihistamines for this long of a period. Thanks for this blog! I had multilevel spinal fusion surgery in my neck. Two weeks after I started itching on my neck and I assumed it was from the cervical collar. Five weeks later and no collar on for almost two weeks now and the itch has gone from the base of my skull to further up my scalp. I have tried lotions, medical pack of prednisone, steroid cream, Claritin and nothing works! I am so miserable as it’s hard to go to sleep and if I do it wakes me in the night. I contacted the surgeon but they just say to contact your doctor. I am going to see him tomorrow and I have an appointment to see a dermatologist on April 23. I hope it’s not an allergic reaction to the titanium plate and screws in my neck. I had this same excruciating itch two weeks post lumbar fusion surgery. The doctors looked at me like I was from another planet when I asked about it, only one said it was stress. I self medicated with Claritin, which helped because the only thing I was told was to reduce stress. I just underwent two surgeries in two days, I am in the most intense pain I have ever felt and I am itching everywhere (identical spots on both sides of my body producing welps) and you want me to de-stress? Okay, right! 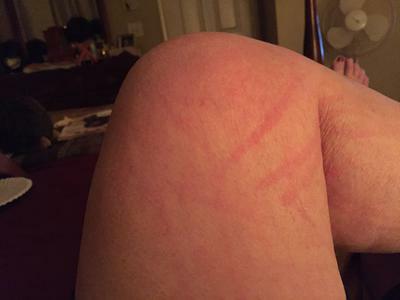 Eventually the itching became less and less and one year post surgery I only itch in random spots on occasion, like several hours after a shower, on my neck, inner thighs or feet. I developed eczema after this surgery, I do not care what they say. I never itched like this before the surgery.